New email marketing features are an exciting thing for us on the Benchmark Email team. On one hand, it’s exciting because we’re a bunch of e-nerds. To us, it’s like a new toy. On the other hand, we’re excited because we get to offer you even better services. 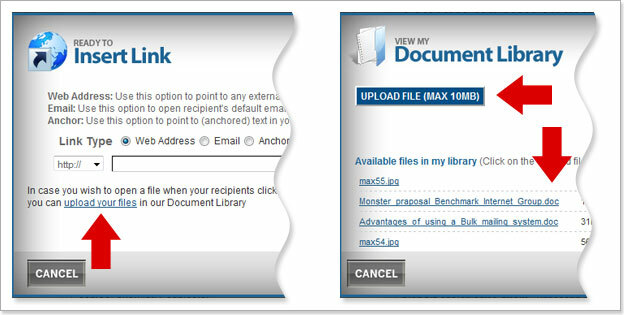 Within our Editor, we now have a new feature that allows you to upload files like PDFs and Word documents, up to 10MB, and link them from your emails. In the Editor, highlight (left click and drag over) the word or group of words that you want to link to an editable PDF or Word doc. Then just select Insert Link in the left-hand column. This is a great way to share larger images, charts or diagrams with your recipients. It will keep your email looking streamlined and readable, while providing the best content possible. After all, an engaged and entertained email list is a happy list.